I love a bit of scraffito work! 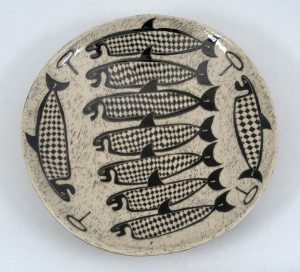 This plate was from 2009 and I still make sardine plates and pots like this. 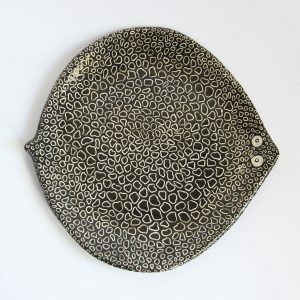 The small fish plates which I sell from my on-line shop are made the same way. After throwing the plate on the wheel it is a process of applying layers of slip. When the plate is dry enough to take wet slip without flopping, in the case of this whopper, it was 4 coats of painted black slip painted which dry to touch, then 3 coats of white slip over the white. I then remove the white slip to reveal the black underneath. Working on a big plate is tricky because it dries too quickly so I wrap all the outer rims with cling film and all across the back leaving just the area I am scratching away to work on. I use a variety of dental tools to get the effect I am after. Left to completely dry out the plate is fired twice in the kiln to finish. Finished fish plates are either black on white or white on black.